People often refer to "Africa" as if it is a country rather than a continent. Well, it is a continent and home to 54 independent, unique countries with South Sudan being the latest addition in July 2011. Each country has its own currency, flag, anthem, history, cuisine, music, identity and blend of cultures. In fact more than 2000 languages are spoken in Africa, and its 1 billion inhabitants are made up of over 3000 distinct ethnic groups. 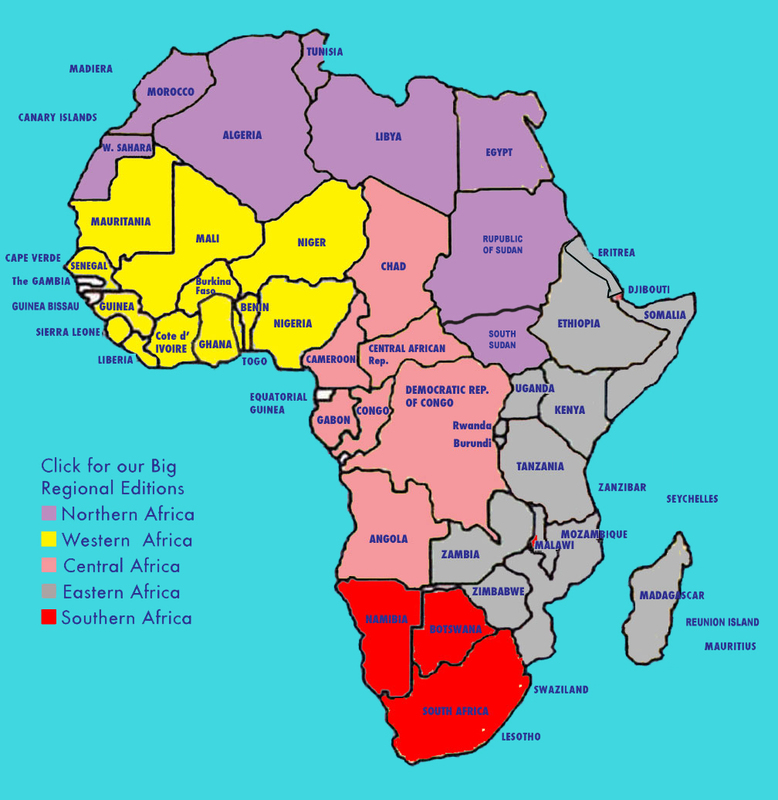 Africa is also bigger than most people think it is, even if they know it covers 30,221,000 sq km (11,679,000 sq miles). If you combine the USA, China, India, Europe and Japan � they all fit into Africa. In fact the USA fits into the African continent three times! Tallest mountain - Mount Kilimanjaro, Tanzania: 19,340 feet / 5895 meters. Lowest point in Africa - Lake Assal in Djibouti which lies at 515 feet (155m) below sea level. Largest desert in Africa is - The Sahara Desert which spans almost 3.5 million square miles (9,000,000 square kilometers). It stretches across North Africa and makes up a large part of a dozen countries. Longest river in Africa - The Nile which is also the longest river in the world. It runs from Uganda all the way to Egypt for 4,132 miles (6650 km). Largest lake in Africa - Lake Victoria in East Africa, bordering Uganda, Kenya and Tanzania. The Lake is the second largest in the world, at 26,560 square miles (68,800 square kilometres). It is the main source of the Nile River. Largest island in Africa - Madagascar off the East coast of Africa in the Indian Ocean is the largest island in Africa and the 4th largest island in the world. Madagascar is just over 1000 miles (1580 km) long and 350 miles (570 km) wide. Largest waterfall in Africa - The Victoria Falls on the border of Zambia and Zimbabwe. The Victoria Falls are just over 1 mile wide (1.7 km) and 355 feet (108 m) high. During the wet season over 500 million liters (19 million cubic feet) of water plummets over the edge into the Zambezi River. The spray can be seen from over 30 miles away. The Equator - In Africa, the equator runs along for almost 2500 miles, passing through 6 countries: Gabon, Congo, Democratic Republic of Congo, Uganda, Kenya and Somalia. Africa is a vast travel destination, both in size and excitement. Africa is three times the size of the United States. You can fit all of Western Europe, Scandinavia, India, the U.S., New Zealand, Japan and most of the Caribbean islands on to the African continent, and still have room for more. Then there is the excitement of Africa -- adventure, heritage, wildlife, biblical, ecological, archaeological, the safaris, plus some of the best fishing diving, eating, dancing and golf -- the phrase "you name it, we've got it" is quite true - even when it comes to romance, anniversaries, reunions, weddings and leisure! The above gives you an idea of what an Africa travel specialist needs to know to assist you, your family and your group with planning and arranging your visit to Africa. Christmas is celebrated throughout the African continent by Christian communities large and small. There are approximately 350 million Christians in Africa. On Christmas day carols are sung from Ghana on down to South Africa . Meats are roasted, gifts are exchanged and family visits made. The Coptic Christians in Ethiopia and Egypt celebrate Christmas on the 25th of December in their calendar, which is the 7th of January for most of the rest of us. Kwanzaa is not celebrated in Africa, as it's an African-American holiday. And unless you're in the Atlas Mountains in Morocco , there's little chance of anyone enjoying a white Christmas in Africa . Even in some of Africa's predominantly Muslim countries, Christmas is still marked for celebration. In Dakar, Senegal's capital, hawkers are happy to sell plastic trees and inflatable santas. "While secularism may mean elsewhere that each person is free to celebrate his or her own holidays, many in Senegal have interpreted it to mean they should celebrate all holidays." (Mail & Guardian). The history of Christianity in Africa dates back to the 1st Century AD. What every missionary has found since that time is that Africans are very spiritual people. (Besides Christianity, the other main religions are Islam and indigenous beliefs). Going to church is generally the main focus of Christmas celebrations in Africa. Nativity scenes are played out, carols are sung and in some cases dances are performed. Being a spokesman for travel to Africa is a 'labor of love' for Jerry Bird -- so much of this vast continent is as wild and free as his birthplace. As a deckhand on the Steamer Keno, last of the paddle-wheeler steamboats to ply theYukon River, Jerry, developed a yen for adventure travel, history and native culture. With a government survey crew, he crossed the Yukon Territory by horseback, braking trail and scaling mountains. He later joined the Royal Canadian Airforce, which sparked his interest in Aviation. His media debut at the Edmonton Journal (Daily Newspaper), was a first step towards the Presidency of the Trans Canada Adertising Agency Network. Jerry Bird and Muguette Goufrani, founded Africa Travel Magazine in partnership with ATA, and with late Garry N. Chaloner, "Air Highways" a travel-business magazine distributed via 50 airports.